Nancy Reagan net worth and bio in details. How rich was the First Lady? How Much is Nancy Reagan Worth? Most modern women are focused on their careers and dream to become successful. They think that it’s impossible to become rich and famous, simply supporting their husbands and caring about their kids. That’s why it’s even more interesting to read about a legendary woman Nancy Reagan. Her net worth is estimated at $25 million. Some part of that wealth the woman earned herself as an actress. But most part of her net worth she inherited from her late husband, the 40th American President Ronald Reagan. It’s possible to say, that the major part of her wealth Nancy Reagan earned, acting as the First Lady in USA. In fact, she was titled as the most popular first lady of all times in 2011. 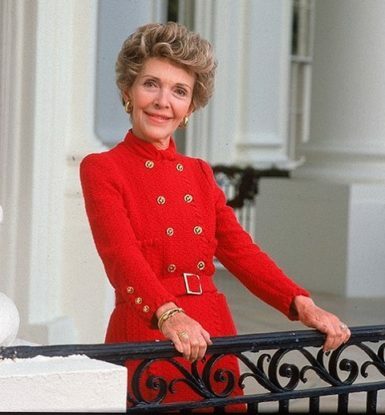 The former actress, Nancy Reagan was perfectly fit and looked great in luxurious brand clothes. She was considered as one of the most elegant and beautiful First Ladies too. Really, beauty costs a pretty penny, but you are not right, if you think that Nancy Reagan earned her astonishing wealth, simply posing in stunning gowns. She served as the great support of her husband at each stage of his career. Nancy Reagan was an active participant and coordinator of both her husband’s presidential campaigns. She organized official meetings, controlled all the events and conferences and hired the best personnel. In spite of all the efforts, in 1976 Ronald lost to Gerald Ford. But four years later he finally won the run. Thus, the perfect woman and a great wife Nancy Reagan has become the First Lady. Let’s see the bio of this legendary personality! Ronald Reagan future wife, an actress Nancy Davis Reagan was born in New York on a hot summer day in 1921. Her birth name is Anne Frances Robbins, but her parents named her Nancy. The girl grew up in quite a rich family. Her mother was an actress and father made the ends meet, working as a car salesman. When Nancy was in her kindergarten age, her parents divorced. Soon Nancy’s mother re-married. Later the First Lady told, that her stepfather was the person, who influenced her more than others. Loyal Edward Davis was a talented neurosurgeon, and a kind and well-educated person. He adopted the girl, thus the First Lady got a surname “Davis”. She has also changed her name for “Nancy” officially. In 1943 Nancy studied performing arts in Smith College. She started career of an actress, but the lack of roles made her try other kinds of job, including the seller and the nurse assistant. In 1949 Nancy finally won her first role. She acted in the movie “East Side, West Side”. In general from 1949 till 1956 Nancy played in more than 11 screen projects. But she left career of an actress, when she married Ronald Reagan. To the moment of their meeting Ronald has already served as the President of Screen Actors Guild. Legends for many people all over the world, in their private life Nancy and Ronald Reagan were just a loving couple and parents of two cute kids – the girl Patti Davis and the boy Ron Reagan. They spent their life in a great picturesque area, where Nancy and Ronald owned a property. Having retired from his second term of presidency, Ronald moved his family into a stunning Bel-Air mansion. It cost $2, 5 million and consisted of two floors. In general the president residency could boast with 17 rooms and premises. Of course, the area around the mansion looked right for the persons of Ronald and Nancy Reagan stature. It included a sparkling swimming pool and manicured lawns. In 2016 the mansion was sold to a billionaire Jerry Perenchio for $15 million. It happened several months after Nancy Reagan death. The woman passed away because of a severe heart failure.